JEAN, NEVADA• The vast desert around this tiny road-stop town has tantalised artists for at least a couple thousand years. Ancient petroglyphs of lizards and unidentifiable creatures dot canyon walls to the north-east. In 1962, Jean Tinguely staged Study For An End Of The World, No. 2, in which he detonated junk sculptures with explosives that he and Niki de Saint Phalle had carefully assembled in their room at the Flamingo hotel in Las Vegas, up the road. And six years later, Michael Heizer created one of his first earth works here, a zigzag trench incised like an abstract painting into the surface of a dry lake bed. The other day, looking from a great distance on Interstate 15 towards the same lake bed, a few pinpoints of brightness were visible, neon anomalies against the dun-coloured scrubland. Upon approach, the points quickly grew bigger, brighter, weirder, like a roadside attraction made by an atomically enlarged infant - seven totem-pole stacks of limestone boulders, the rocks painted in Kool-Aid shades so intense they were sometimes hard to look at in the full sunlight. "Stacking stones is such a universal impulse, an activity that has gone on around the world as long as humans have been here," said Swiss artist Ugo Rondinone, climbing from an SUV to see for the first time the project he had been working on for more than five years. 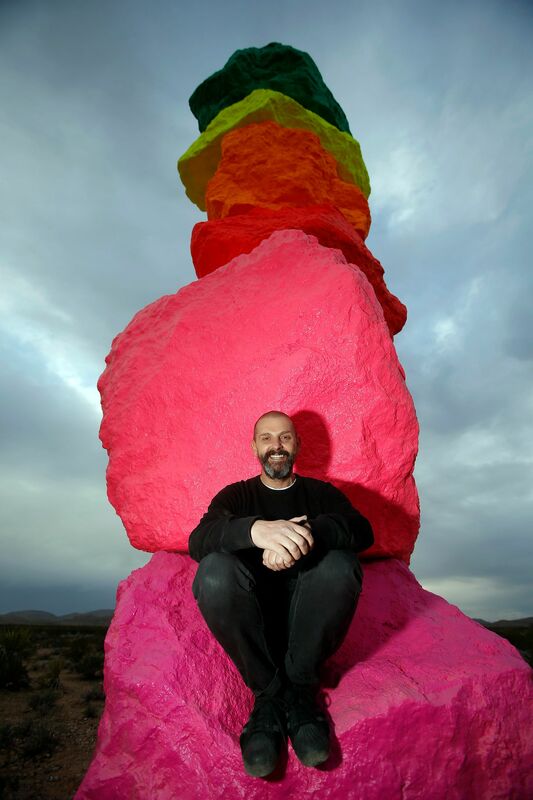 Seven Magic Mountains is his largest public art installation and one of the most ambitious pieces of his career. The work, which officially went on view last Wednesday, is one of the largest land-art pieces created in the United States in the last 40 years, in a part of the West that defined the land-art movement beginning in the 1960s with artists such as Heizer, Robert Smithson (Spiral Jetty in Utah), Nancy Holt (Sun Tunnels, west of the Bonneville Salt Flats) and Walter de Maria (The Lightning Field in western New Mexico). Rondinone's desert intervention also serves as a case study for how some young contemporary art museums in smaller cities - in this instance the Nevada Museum of Art in Reno, which oversaw the work's creation along with the New York public art organisation Art Production Fund - are trying to think outside the cookie-cutter approach to developing a programme and a reputation at a time when art prices have made building a large, diverse collection almost a fool's game. Over the last eight years, the museum has increasingly staked its future on becoming known for its expertise and holdings in materials related to art and the land, not just in the US but also around the world. Building on a renowned collection of photographs by artists such as Robert Adams and Edward Burtynsky who have charted humanity's impact on the land beginning in the late 20th century, the museum founded the Centre for Art and Environment in 2008, devoted to what it calls "creative interactions between people and their environments". The centre is home to a rapidly growing archive, now one of the largest in the world, committed to land art. And with the Rondinone project, the museum is now moving past exhibiting photographs, documentation and artefacts from historical land-art pieces and decisively entering the business of ushering new pieces of art into the world. "I saw no reason when I came here in 2007 to strive to make this into an encyclopaedic museum or one that would have a general collecting focus," said Mr David B. Walker, the museum's executive director and chief executive. "Or you could also go down the easy, convention-centre path - taking these big flashy travelling shows and drawing big crowds to those and making a lot of people happy without much to show for it." He and his curators, including William L. Fox, a poet and historian of land art who runs the Centre, believe that the museum, in its city perched on the western edge of the Great Basin, is a logical home for such a focus and can distinguish itself by delving deeper than larger establishments are likely to do. The mission has already begun to pay off in support. All the documents and ephemera chronicling the creation of the pieces - and they are legion - will go into the museum's archives. And the outsize presence of the sculptures within easy driving distance of Las Vegas, rising from a scatter of mesquite bushes, yucca and stumps of dead Joshua trees, is like a high-art billboard for the institution's particular ambitions. "I came out here the other day to watch trains - that's what I like to do - and I spotted these things and told my wife, 'You've got to come out here and see this'," said Mr Bobby Deren, a retired pilot who had parked alongside the road the other day and hiked with his wife to inspect the pieces up-close before they opened to the public. The two were vacationing in Las Vegas from Vancouver, Canada, and Mr Deren said they were far from the first to feel the need for proximity to the oddly beckoning towers. "There was a gal out here before posing in front of them naked except for a scarf."